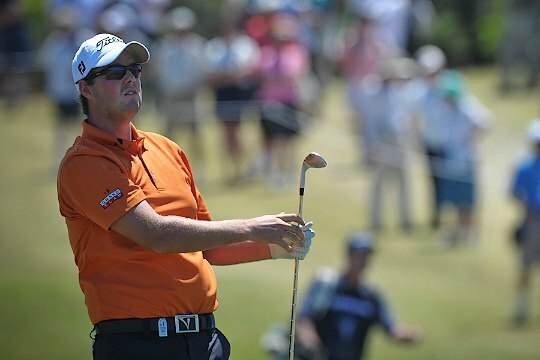 Aussie Marc Leishman has finished in a tie for third position at the Byron Nelson Championship four shots behind the winner, American Brendon Todd. Todd fired a four-under par 66 on Sunday to hold off Canada’s Mike Weir for his first PGA Tour title, a US$1,242,000 cheque, a PGA Tour exemption through the 2015-16 season and a spot in next year’s Masters. Todd, whose previous career-best effort was a share of sixth at this year’s Texas Open and Humana Challenge, has had to go back to the Web.com Tour twice in the past five years to regain his card. “It was a dream week for me on the golf course,” said Todd. Sunday’s victory was the breakthrough the 29-year-old was after and Todd was holding back his emotions during the press conference. “I’m excited about the relief, like I finally have a chance to play the PGA Tour for multiple years,” Todd said. Leishman also had a great week recording his third top-10 finish on the PGA Tour for the season. With US Open spots on the line as the top-60 in the world as of 9th June gain automatic entry there was plenty to play for. Leishman is currently 62nd and on the verge of playing his 4th US Open and 14th Major appearance since turning professional in 2005. “It’s good to get back in the hunt,” said Leishman, whose single win so far on the PGA Tour came in 2012 at the Travelers Championship to add to his career total of eight professional victories. John Senden finished the best of the Australians after Leishman in a tie for 11th, with Greg Chalmers in 22nd position.